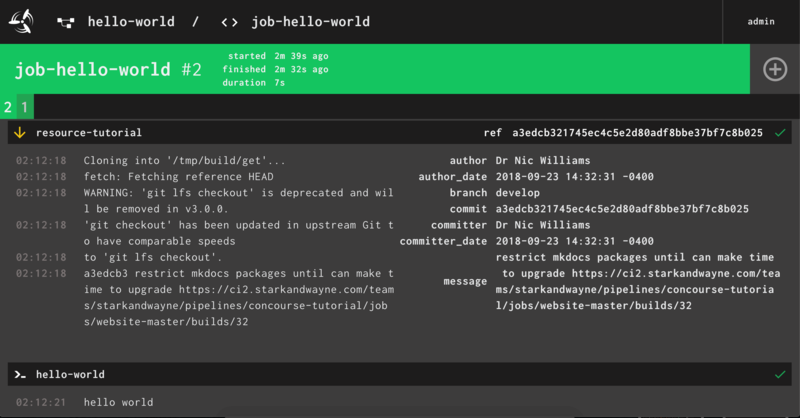 It was very helpful that the job-hello-world job build included the terminal output from running git commands to clone the git repo and the output of the running the hello-world task. The --build NUM option allows you to see the output of a specific build number, rather than the latest build output. The fly watch command can also be a battery saver on your laptop. Hear me out: I've observed that watching jobs run in the Concourse Web UI uses a lot more battery power than running fly watch in a terminal. Your mileage may vary.